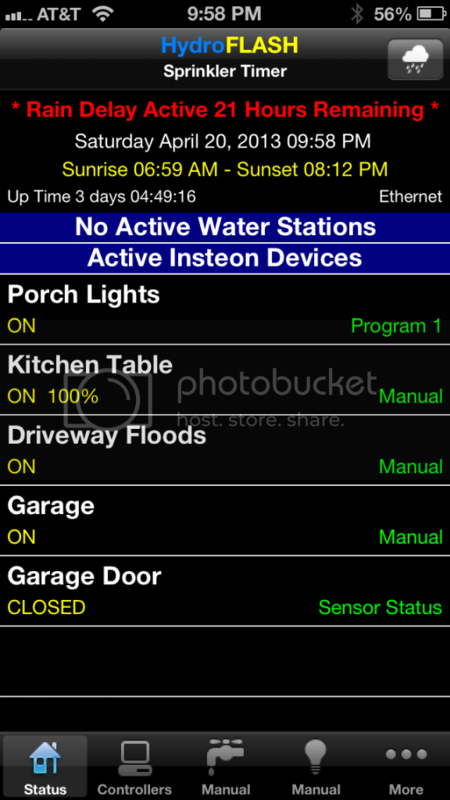 I just installed a garage door sensor, and its status is opposite what I would expect on the Insteon app. When the door is open, the status is "CLOSED," and vise versa. Everything else functions-- the app will open/close the door, and I setup a scene between the I/O Linc and other lights that works. I have the sensor installed at the top of the door so the two are in contact when the door is closed. And, when the door is closed, the green sensor LED is on. Here are a screen shot of the status with the door open and of the device settings. 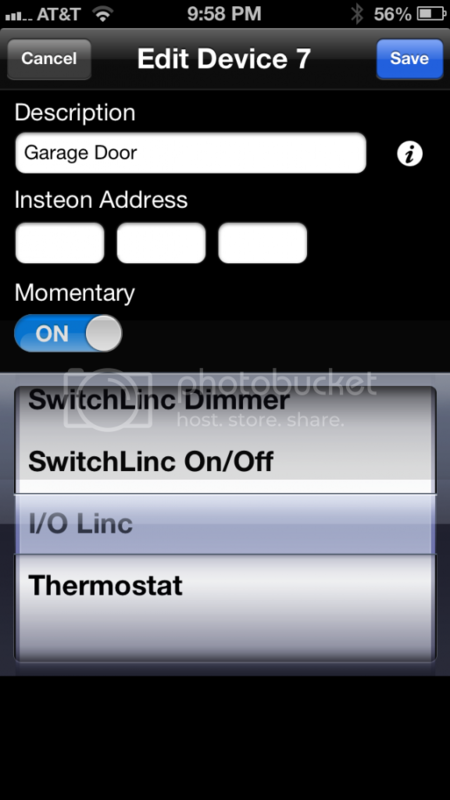 We are currently working on a updated software version that allows you to configure the "text" that is displayed on the mobile app and the web interface to reflect the status of a Insteon I/O link correctly. By "correctly" I mean that an I/O Link can be used for other things than a garage door or gate. For instance it could be used to status a water tank or , pool level where the status value returned would be better described as "Full" or "Low". (Or Pump Running / Pump Off) Additionally the the value driving the I/O sensor could be inverted for the intended use and cause the issue you see. Additionally currently are designing a small interface board that easily attaches to an I/O link connector that will allow better interfacing to other devices. It will be available on the HydroFLASH Web page under Accessories in the coming weeks. You should be good to go after the update. This should cover most users for the time being until we update the firmware with the customized field option. Huge shout out for a quick and perfect fix. I really appreciate it. I was about to start looking for a different type of magnetic switch that had the opposite switching behavior from the switch that I got. Shame on Smarthome for selling the garage door kit with a switch that produces an "open" message when the garage door is closed (if you installed it as the instructions recommend). Thanks guys for fixing that here. I am hooked on this Insteon stuff. I bought this for the sprinkler timer, and I have not even run my sprinkler yet this season. briangray, I am looking to add Insteon to our house, but am a complete moron when it comes to it. Would you mind linking to the garage door remote system you installed? This is what I got for my door. Thanks! I was looking at that, but it's unclear to me whether it would go in parallel with the temporary GDO switch, or replace it. I need to read up a little more I guess. It goes in parallel with your existing GDO switch. Yeah, it is totally addictive. I had no plan to buy any Insteon stuff prior to my HydroFLASH. And, as an aside, the simple interface of the HydroFLASH app is way better at Insteon device control than other more expensive hubs and apps that I have seen. So, prepare to go a little crazy. briangray wrote: It goes in parallel with your existing GDO switch. So my Insteon GDO & Status Kit will be delivered on Saturday. Just so I'm crystal clear here - the cable connecting to the GDO will be wired in parallel with the wall switch? Meaning, Insteon will trigger a momentary close action on those two terminals at both open and close, and the magnetic sensors going on the actual door and guides are purely for state feedback?